polka & bloom: New patterns! Yup, that's right; patterns. I guess inspiration struck and then one thing lead to another and here we are with two new patterns in the Polka & Bloom Artfire shop. 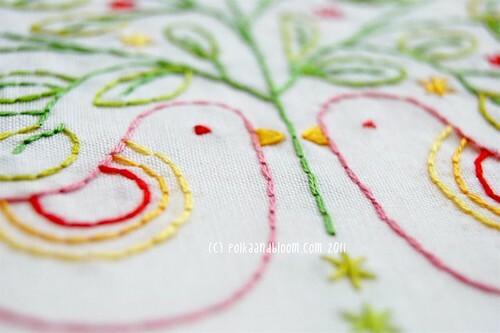 First, 'Love Birds' - It's kind of a Valentine's pattern, but you can use it for other times and things. 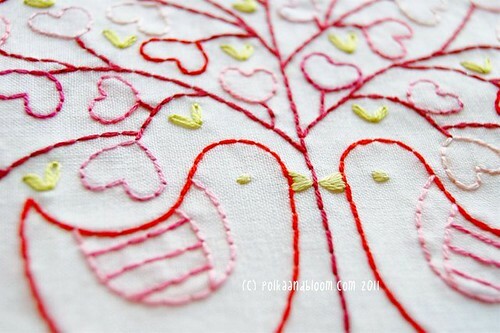 I've been fantasizing about stitching it in Delft blue on white - I think that would look quite pretty. Next, 'Spring Birds' - January is such a drag, isn't it? I really wouldn't mind if spring started on, say, January 1. Wouldn't that be nice? Well.. until spring actually appears, you can pretend it's here already with these sweet birdies. Both patterns are in the shop now and you can even buy them together for a mere $7.00!